These days, there isn't much our iPhone camera can't do - except feel like an actual phone. Despite years of steadily increasing resolution and image sensing technology, we're still taking shots awkwardly with two hands, fumbling for the shutter button. Leave it to an avid photographer to design Shuttercase, a versatile iPhone case that solves that problem and more. Most significantly for photographers of any experience, the Shuttercase moves the shutter button to the side - just like the classic 135 point-and-shoots. It further replicates that feel with the case itself, which supplies enough heft that you can grip it and shoot with one hand. 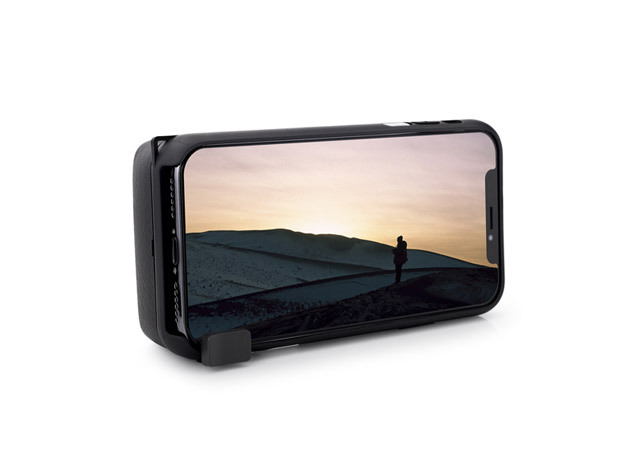 It also packs an embedded stand, and - because long photo sessions can drain your phone like nothing else - a 3,000 mAh battery that will charge as you go. Now you're set to unlock the full potential of your camera, whether that's panoramic vacation shots or perfectly composed family photos. Originally $79.99, the Shuttercase for iPhone is now 37% off at $49.99.